Weight: 4-6 lbs. but can be as large as 15 lbs. As in most toy breeds, dental issues are a very common problem; some dogs, the very small ones especially, may also suffer from hypoglycemia, a potentially fatal drop in blood sugar. Hypoglycemia can usually be managed with diet, but dogs prone to this condition will need careful monitoring, which precludes spending long hours alone. Puppies are especially susceptible to this condition. Collapsed trachea and liver shunts are known in the breed, and there is a likelihood of retained baby teeth; when this happens, adult teeth are unable to come in in their proper position. This can cause painful sores in the palate as well as an increased likelihood of decay later in life. Because of this, retained baby teeth are usually pulled. A veterinarian experienced in treating toy breeds should perform any surgical procedures, as they are at a higher risk from anesthesia. Harnesses are recommended to avoid putting additional pressure on the Yorkie’s delicate trachea. 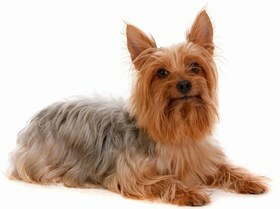 The Yorkshire Terrier, or Yorkie as they are affectionately known, is a feisty but loving little dog. Some Yorkies are cuddly and doting, others are outgoing and mischievous and into everything. Many are suspicious of strangers, and make good watchdogs. Yorkies are appropriate companions for the elderly and novice dog owners. They can make successful apartment or condo dwellers and are often good with older children, but toddlers are not recommended for toy breeds as accidental drops, being stepped or fallen on, etc. can result in serious injuries. Just as your dog will need careful socialization to learn appropriate behavior around children, your children must be taught how to properly interact with your Yorkie. Children should always sit on the floor to hold a Yorkie to avoid accidental drops or injury resulting from a dog jumping out of their arms. Never allow children to pull ears, poke eyes, etc. Children should be taught how to recognize when a dog needs a break and give them space. Devoted companions, Yorkies are not recommended for long periods alone; a lonely, isolated Yorkie can develop anxiety issues, destructive behaviors and excessive barking. Yorkies don’t tolerate cold at all, and will need a sweater or coat when temperatures drop. They will enjoy some outside time when the weather is pleasant, but a very secure yard is mandatory; they can squeeze out of very small spaces. Other outdoor dangers include being attacked by hawks, eagles, coyotes and large dogs. A Yorkie should never live outdoors. Some Yorkies can be aggressive to strange dogs, which can be dangerous. Satisfying a Yorkie’s exercise needs is easily done in home or yard. They will also enjoy a neighborhood walk (on a harness), but in inclement weather, play sessions at home can keep them happy and fit. With a high prey drive, most Yorkies love playing with toys. Typically active indoors, and they need a lot of stimulation, which can be supplied through interactive toys and training. It has been said that a contented Yorkie is a quiet one. Many times the reverse is true; a barking Yorkie may be a bored Yorkie. Social and intelligent, the Yorkie typically learns quickly, especially when positive reinforcement methods are used. Indeed, there is little reason to use punitive, forceful methods on such a devoted, willing and bright little dog. Doing so may shatter their trust in you and leave them confused and afraid. Many Yorkies compete in various dog sports and greatly enjoy showing off their tricks. Housetraining a Yorkie can be difficult, especially since many a Yorkie is woe to set foot on wet ground. A doggie door leading to an enclosed and covered area can work; many owners opt for an indoor potty option for their dogs, such as pee pads or another type of potty tray. Yorkies have very small bladders, and having an acceptable location for the dog to relieve itself will reduce the likelihood of accidents in unwanted places. 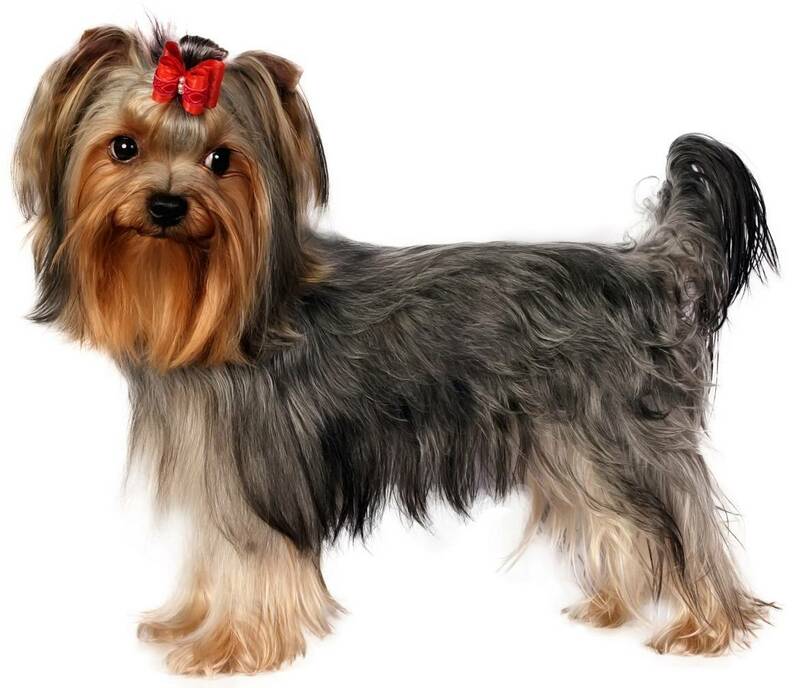 Your Yorkie will need careful early socialization to people and dogs; with toy dogs, you must walk a line between keeping them safe and allowing them to stand on their own two feet, confidently experience the world and be well behaved. Particular care must be taken when exposing your Yorkie to other dogs; select dogs carefully as toy dogs don’t realize their size disadvantage, and must be protected from harm. They should be kept on leash when around other dogs. With a lifetime of grooming ahead of them, it is wise to teach your Yorkie puppy to enjoy the process. 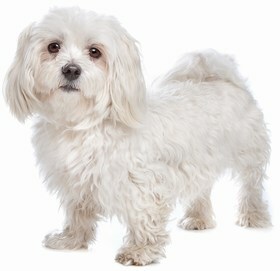 Start with short sessions, or take the puppy to the groomer for ‘introductory’ sessions. The Yorkie carries a beautiful single coat that, because it has no undercoat, is much like human hair and hypoallergenic for most people. As a result, they shed little. 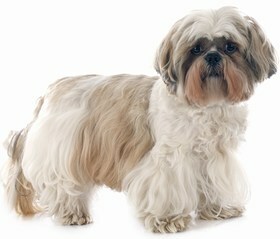 Like human hair, the Yorkie coat continues to grow, and will reach the floor if not cut. Kept long, the coat requires meticulous daily brushing and combing; dogs that carry a soft, cottony coat will mat much more quickly than the silky coats. Many people opt to clipper the hair to a shorter length for easier upkeep; this will need to be done every 6-8 weeks. Even when clipped, your Yorkie’s coat will need brushing a few times a week. 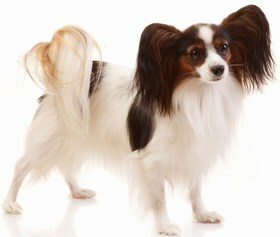 If the coat is kept long, caution should be used as the dog’s skin at the hair part is subject to sunburn. Many Yorkies get a weekly bath to keep them fresh and clean; a gentle shampoo formulated for dogs should be used. Ears must be cleaned regularly, and toenails will need to be trimmed, as most Yorkies will not wear their nails down even if walked on concrete. Teeth must also be checked and cleaned regularly; daily brushing is recommended. Yorkies will typically eat an average of 1/2 – 3/4 cup per day. This should be fed in 2 meals per day; if your dog suffers from hypoglycemia, you will probably need to feed smaller amounts up to 4 times a day. Your veterinarian can advise on how best to manage your dog’s blood sugar. Some Yorkies can be picky eaters, which will be made worse if they are fussed over at mealtime. Sensitive tummies are also not uncommon, and too many treats or sudden changes can result in upsets. A constant supply of fresh, clean water must always be available. Prices for Yorkies range between $600-$1,200. The “micro” or “teacup” Yorkies are sold for upwards of $5,000-$10,000. Be aware, there is only one Yorkie breed; those marketing “micro” or “teacup” dogs are using marketing to sell especially tiny dogs. Those intentionally breeding for extremely small sizes often place extreme size above the health of the dogs Under-sized dogs are more at risk of genetic disorders and have shorter lifespans. There are also many rescue organizations where lovely dogs can be found; adoption fees vary widely, but are generally in the $200-$500 range. The Yorkie rates a 2.5. Their cost is not usually prohibitive, they are usually easy to live with and have no great need for ongoing training to be happy; their primary challenges are grooming needs, health issues and the inherent frailty of a toy breed.